DVDFab Blu-ray Copy is the first full-featured and the most powerful Blu-ray Copier/Burner/Decrypter which can remove all known Blu-ray protections, copy Blu-ray to any blank Blu-ray/DVD disc or hard drive, and burn existing Blu-ray folder / ISO file to disc with great speed and effect. 4 copy modes are available: Full Disc, Main Movie, Clone and Write Data. Besides, there are also various settings for you to customize your Blu-ray. ...... 4 Blu-ray Copy modes available: Full Disc, Main Movie, Clone and Write Data. 6. Multiple settings for you to customize and personalize your Blu-ray. 7. Copy and backup Blu-ray to hard drive. 8. 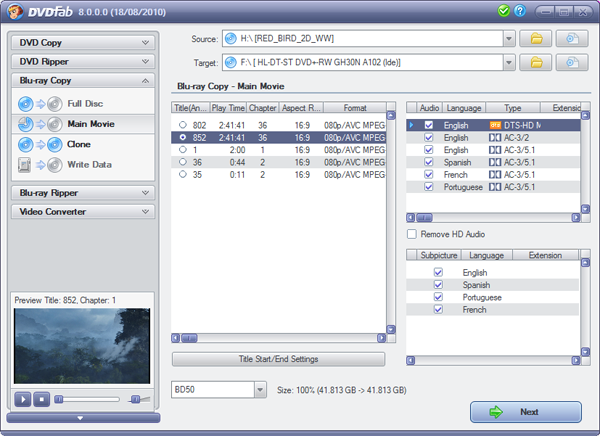 Burn Blu-ray or existing Blu-ray folder / ISO file to any blank Blu-ray/DVD disc. 9. Burn to any blank Blu-ray disc (BD-R 25, BD-RE 25, BD-R 50, BD-RE 50). 10. Burn to any blank DVD disc (DVD+R/RW, DVD-R/RW, DVD+R DL, DVD-R DL). 11. Remove Region Code, BD-Live and UOPs. 12. Remove all known AACS, BD+ copy protections. 13. Constantly updated to support latest Blu-ray movies, Blu-ray burners and blank Blu-ray discs. Qweas is providing links to DVDFab Blu-ray Copy 8.1.9.0 as a courtesy, and makes no representations regarding DVDFab Blu-ray Copy or any other applications or any information related thereto. Any questions, complaints or claims regarding this application DVDFab Blu-ray Copy 8.1.9.0 must be directed to the appropriate software vendor. You may click the publisher link of DVDFab Blu-ray Copy on the top of this page to get more details about the vendor.